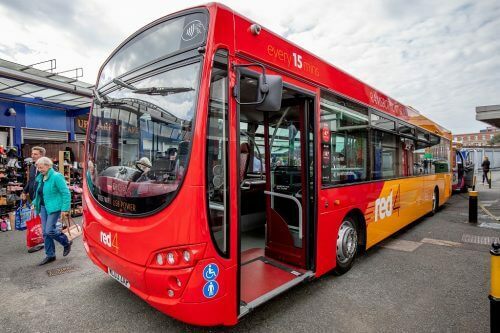 Transdev subsidiary Rosso has unveiled its new Red 4 service to Ramsbottom and Bury, offering quilted leather seats, WiFi and USB charging points. Travel on the newly-kitted-out and refurbished buses is available from just £1 for the first two weeks (until Sunday, 16 September) – but passengers must be wearing red to take advantage. Red 4 will run every 15 minutes from before 0600hrs until after 2200hrs during the week. Alex Hornby, CEO at Transdev, said: “When Rosso joined our family of bus companies earlier this year, we promised to bring something new and exciting to raise the quality of this popular service to offer First Class travel – and these amazing Red 4 buses certainly do that in style. “The positive welcome for the revitalised buses from our customers is fantastic – each bus has quilted leather seating, free WiFi, and USB at-seat power, on a high-quality service that people will really want to be seen on. “Our research has shown that customers will respond well to this step change in quality, and the positive welcome so far for these revitalised buses has been fantastic.